is aimed at raising driver awareness towards the problems associated with blocking bike lanes. The Safe Routes to School program makes bicycling and walking to school a safer and more fun alternative to being encased in parents’ cars, thus encouraging a healthy and active lifestyle. Early development of good physical habits will pay dividends later for Oregon’s young people. 98% of all Harleys ever sold are still on the road. The other 2% made it home. Before you criticize people, you should walk a mile in their shoes. and you have their shoes. "We share the bike lane with you" is a often heard answer from drivers parked in the bike lane. This broken sign was reported last week. A few days later the sign was fixed - and THANKS! Dan Flores Construction parked in the bike lane at Kingwood Street. Dashed bike lane improvement - WOW! The painter wasn't an artist but who cares - and THANKS! Little learning here. Parked in the bike lane, parking in the street too over a solid line. For the 4th (!) time on this blog now. There's no space for cyclists nor for pedestrian. There's not even a sidewalk! Do we have to walk in the street now? A common problem in front of this place ... it is easier to brake the law than to park in the driveway. Bike to School in Florence Oregon HUGE SUCCESS! Stencils should be placed after most intersections; this alerts drivers and bicyclists entering the roadway of the exclusive nature of the bike lanes. Stencils should be placed after every intersection where a parking lane is placed between the bike lane and the curb. Supplementary stencils may also be placed at the end of a block, to warn cyclists not to enter a bike lane on the wrong side of the road. approximately every 1400 feet. Metric formula: speed times 7; e.g., appropriate spacing in a 60 km/h zone is approximately 400 m.
driveways and the area immediately after an intersection. At their June 2008 conference, the U.S. Conference of Mayors recognized that bicycling should be promoted for many reasons including transportation, environment, and health. as of July 11th 2010 this blog had visitors from 69 countries. The world is watching! 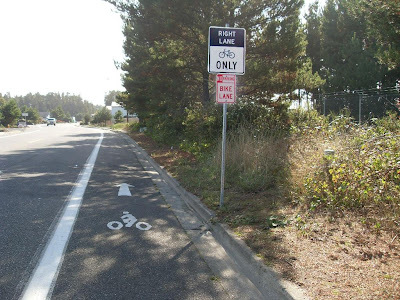 Councilor Osbon asked if staff was taking the bike lane out of Kingwood; she had heard the bike sign was gone and the stripes on the street were being eliminated. PWD Lanfear said the signs must have been stolen and where there was an 8” shoulder line there was no parking allowed. Mayor Burns said that council had received an email regarding the bike lane and said that there was a petition given to the council that requested that the bike lanes between 9th and 10th Streets not be taken out; but nothing from 15th Street North. PWD Lanfear said the council about 5 years ago, directed staff not to keep repainting the bike lane between 9th and 10th Streets because it is residential and people wanted to park in front of their own homes. He said from 10th on, it was still designated as a bike lane and there was no legal parking on the street. A bicycle lane as defined by ORS 801.155(6) shall be separated from the adjacent roadway by a single, solid eight-inch wide white stripe. Improving the quality of life for citizens and visitors by providing a safe and effective transportation system to residences, employers, services, social, and recreational opportunities. Creating additional opportunities to enhance the City as a tourist destination. Striping and signing of existing bike lanes and raising driver awardness towards the problems associated with blocking bike lanes. Do not drive on a bicycle lane. You may cross a bicycle lane when turning or when entering or leaving an alley, private road or driveway. You may use a bicycle lane as part of an official duty, such as delivering mail. Farm equipment may briefly use a bicycle lane to let other traffic pass. You must yield to bicycles in a bicycle lane or on a sidewalk before you turn across the lane or sidewalk. You may not park any motorized vehicle on a bicycle path or lane. A person may operate a moped on a bicycle lane that is immediately adjacent to the roadway only while the moped is being exclusively powered by human power. Required in the course of official duty. An implement of husbandry may momentarily cross into a bicycle lane to permit other vehicles to overtake and pass the implement of husbandry. A person may operate a motorized wheelchair on a bicycle lane or path. A person may operate a motor assisted scooter on a bicycle lane or path. - $117 Billion annual cost due to people being overweight or obese in the U.S.
Did you receive a little present from a concerned citizen recently? He or she may have wanted to remind you that your choice to block a bike lane was unsafe and probably illegal. 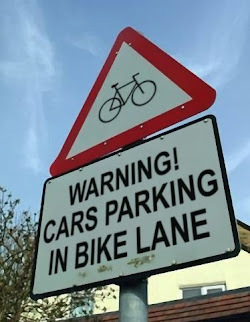 Parking in, double parking in, or otherwise blocking a designated bicycle passageway forces cyclists (and others using this lane) to ride into the street, possibly blocking traffic and placing the cyclist in harm's way. Think: car moving at 45 mph and bike moving at 10 mph. What fun! Bike lanes are there for a reason. Please be respectful in the future.